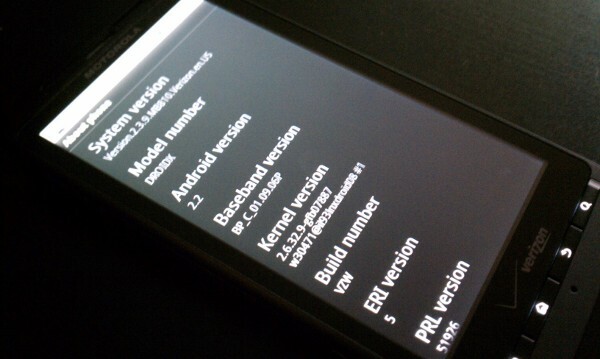 Rumors: Android 2.2 for DROID X Delayed? Or Rolling Out Now? Labor Day seemed like a great time to dip into the mailbag and see what kind of rumors were floating around and if any of them had to do with the status of Android 2.2 for the Droid X which we’ve all been waiting impatiently for. Luckily we have a couple of stories in the works, both of which haven’t been confirmed by any of our Verizon connects, but are still interesting enough to let you know about. We’ll start you off with the bad news first meaning this is the delay portion of today’s rumors. According to one of our tipsters (a government telecom guy), the DX update has been delayed anywhere from 2-3 weeks and is apparently still running into Exchange issues, some of which are wiping security policies when moving from 2.1 to 2.2. The current test build has been sent back to Moto for fixing. I can’t say that I’ve tested any of the Exchange settings in the leaked 2.2 build, so I’ll have to ask readers to weigh in on whether or not there are still security issues. This isn’t the first time I’ve heard this rumor though which leads me to believe it. The second part of today’s rumor mill is more of a chance for everyone to let out a little laugh to end a long weekend. According to 3 separate emails from 3 separate and non-related tipsters, we are getting word that the Droid X Froyo update has been rolling out since 8/27! Yep, it started almost 2 weeks ago! News to you? Us too! Obviously these reps are referring to the Droid Incredible update which did in fact start on 8/27. The amazing thing is, that two of our guys called back on a separate occasions, asked specially 3-4 different ways if the rep meant the DI and each time were told, “No, the Droid X started on 8/27.” Yikes. When should you expect the DX update then? We’re thinking next week at the earliest. And I seriously hope we’re wrong on this one.